According to the latest data, at least 3.6 million students in 2010 were enrolled in tertiary education abroad, up from 2 million in 2000. East Asia and the Pacific are the largest source of international students, representing 28% of the global total. Students from China make up one-half of this figure, or 17% of the total. The United States, Australia, and Japan are their main destinations for study. Several countries have more students studying abroad than at home for example countries like Andorra, Anguilla, Bermuda, Dominica and Liechtenstein so mostly students from these countries all prefer coming to the United States. Chinese student enrolment in the United States rose to a total of nearly 158,000 students, or nearly 22 per cent of the total international student population, making China the leading sending country for the second year in a row. Yet, India, as a destination for U.S. students study abroad, increased 44.4 percent. While slightly declining in numbers, students from India still represent 14 per cent of all international students in U.S. higher education, with tens of thousands more students from India in U.S. higher education than in any other host country. South Korea is the third leading place of origin, with more than 73,000 students, increasing by two per cent and making up 10 per cent of the total. 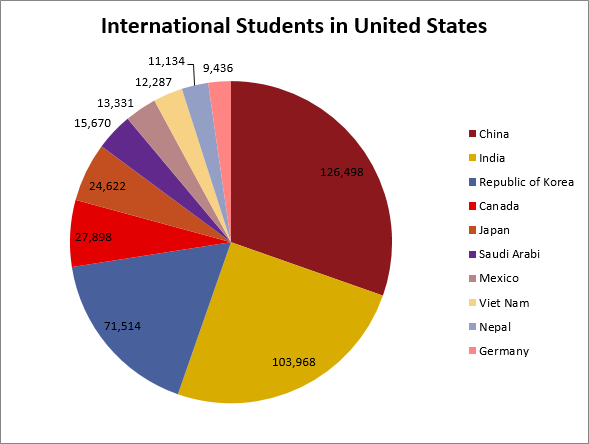 As the above chart helps you to see that many students come from different countries and it might help students get a rough estimate of the different nationalities that you can be expecting to see in your university.